‘SIMPLE EGG DELICACIES’ is a collection of simple and easy recipes of delectable Egg Dishes for Breakfast, Lunch and Dinner and for all other times as well. The selection covers a wide selection of Breakfast Egg Dishes, Mouth watering Curries, Egg Salads, Tasty Tea Time Snacks and Treats, Sandwiches, Casseroles and Baked Dishes. In addition to the recipes, ‘Some handy hints on how to store and preserve Eggs’, ‘A few Quick Serving ideas using Eggs’, besides some useful tips and tricks on how to prepare a variety of fluffy and soft Omelettes and the names and description of the various Egg Dishes are also given. I decided to bring out a Recipe Book on exclusive Egg Recipes since I found that many people who are vegetarians do include Eggs in their diet. 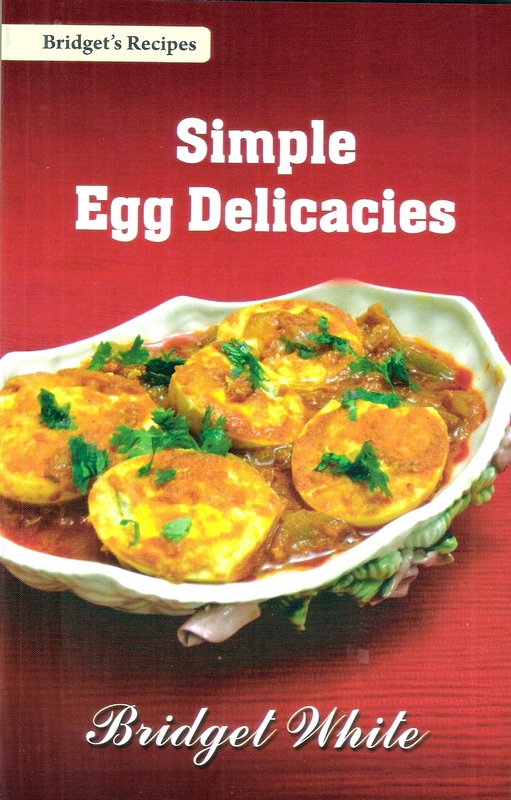 This Book ‘SIMPLE EGG DELICACIES’ is a real treasure for ‘Eggetarians’ as there are recipes for a variety of egg dishes under different categories. The recipes are mostly Anglo-Indian but I’ve also included some tasty Indian Egg curries and some universal all time favourites such as Eggs Benedict, Egg Florentine, One Eyed Jack, Coddled Eggs, Shirred Eggs, Egg Frittata, Egg Quiche, Egg Custard, Eggs Mornay, Egg and Sausage Casserole, Scotch Eggs, Devilled Eggs, the Classic Egg Salad, French Toast Casserole, etc. The recipes are very easy to follow and only easily available ingredients are made use of. Posted on June 27, 2014 by Bridget White-KumarPosted in Cookery Books, Egg Delicacies, Eggs, SnacksTagged Egg Delicacies, Egg Recipes, Eggs, Recipe Book on Egg Recipes, Simple Egg Delicacies.